Watch this video for the fast intro. An introductory resource for beginners and a long-term reference. See this structured explanation of everything from data management to computational geometry and working with Revit. A community powered, comprehensive reference to the functionality and utility of every node in Dynamo. 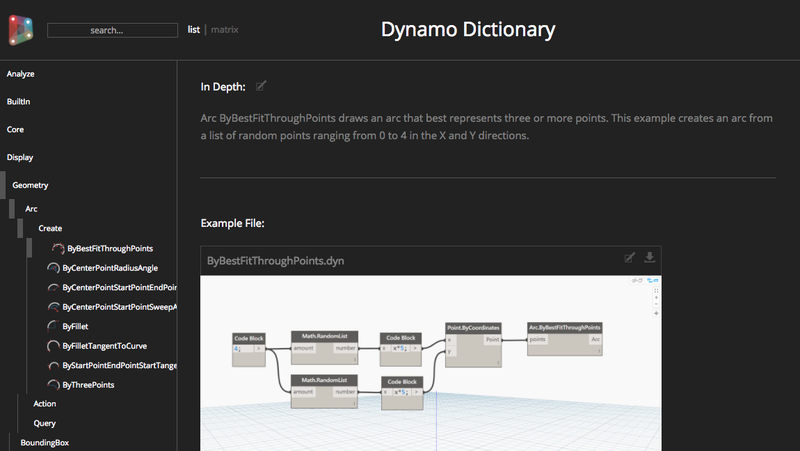 Use the Dynamo Dictionary as a quick reference or an in-depth guide to extend your skills and empower your graphs. Dynamo hosts a thriving ecosystem for Development. 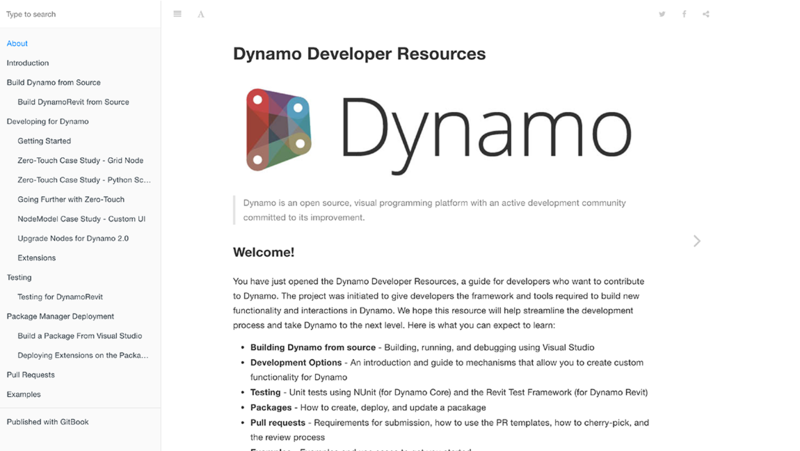 This page takes you down the rabbit hole of all of the tools available for customizing your Dynamo experience. From top-to-bottom, we’ll start with the ‘out-of-the-box’ options and go deeper as we progress down the page. Launch Dynamo for the first time. 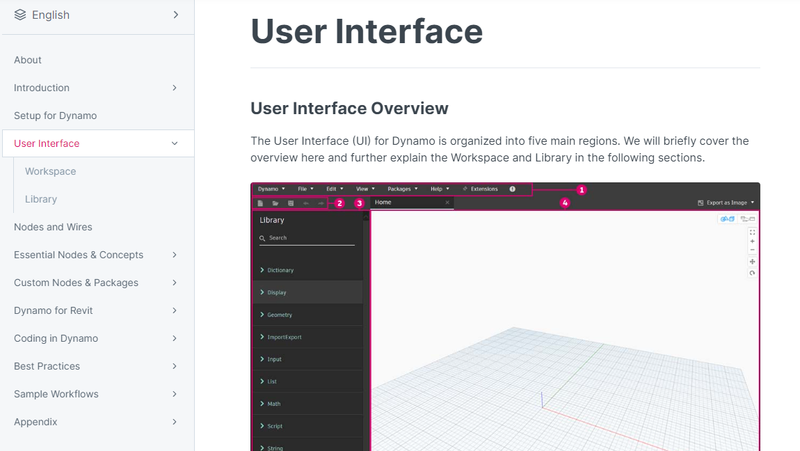 Take a tour of the Dynamo user interface. Learn how to open and interact with Dynamo files. A closer look at the program elements used to interface and connect a Dynamo definition to a Revit Document. Basic concepts for working with lists. Basic concepts for working with lists and nested lists. Computational attractor system using the environment data from Autodesk Revit. Instantiate a Revit Family element with Dynamo. Control Family Type parameters with Dynamo. Control Family Instance parameters with Dynamo. Reference a curve into Dynamo. Divide a curve using U parameter divisions. Place adaptive components in the curve. Reference Revit geometry into Dynamo. Create a system for placing Adaptive Component families. Control updates between the Family and Project environments. A unique feature in Dynamo that brings the visual programming and textual programming environment together. Create custom functionality to reuse it. In this lesson we will introduce the building mass for the course, demonstrate its parametric flexibility, and explain the geometric applications of its parameters. This introduction will be entirely in Revit. In this lesson we will edit building mass parameters from within the Dynamo environment. Run Automatically will be checked so the user can visualize a range of building mass options. In this lesson we will edit multiple parameters for the building mass in dynamo. In order to do this properly, we’ll introduce lists into our workflow. Lists will be a critical focus for the remainder of the lesson. In this lesson we will set several parameters for our building mass in Dynamo. Without geometric constraints explicitly defined in the mass family, we will introduce numerical constraints to create new parameters. Formulas and conditional statements will also be introduced. In this lesson we will introduce Dynamo’s basic tools for adding Structural Framing Elements to a Revit document. The end result will be a linear array of beams across the atrium of our building mass. Part 1 of 2. In this lesson we will introduce Dynamo’s basic tools for adding Structural Framing Elements to a Revit document. The end result will be a linear array of beams across the atrium of our building mass. Part 2 of 2. In this lesson we will introduce Dynamo’s family by point node. The end result will be a two-dimensional array of photovoltaic panels on the roof of our building. Part 1 of 3. In this lesson we will introduce Dynamo’s family by point node. The end result will be a two-dimensional array of photovoltaic panels on the roof of our building. Part 2 of 3. In this lesson we will introduce Dynamo’s family by point node. The end result will be a two-dimensional array of photovoltaic panels on the roof of our building. Part 3 of 3. In this lesson we will introduce Dynamo’s Adaptive components by point node. The end result will be a series of vertical trusses along a doubly skinned façade system. This will take a closer look at plane/solid intersection and list management. Part 1 of 2. In this lesson we will introduce Dynamo’s Adaptive components by point node. The end result will be a series of vertical trusses along a doubly skinned façade system. This will take a closer look at plane/solid intersection and list management. Part 2 of 2. In this lesson we will use the Set Parameter Node to parametrically control a level in our Revit Project. We’ll refer to the great potential behind using Dynamo to control documentation sets, views, and sheets. Dynamic level adjustment will show changes in the 3D model, as well as sheet adjustments with automated visibility settings. Part 1 of 2. In this lesson we will perform geometric operations on imported SAT files with Dynamo. A complex surface will be introduced to the Revit project, and we will use Dynamo to create a rationalized waffle grid from the shape. 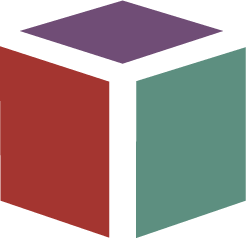 Bounding box operations and plane intersections will be dealt with on a more in-depth level. Part 1 of 3. In this lesson we will perform geometric operations on imported SAT files with Dynamo. A complex surface will be introduced to the Revit project, and we will use Dynamo to create a rationalized waffle grid from the shape. Bounding box operations and plane intersections will be dealt with on a more in-depth level. Part 2 of 3. In this lesson we will perform geometric operations on imported SAT files with Dynamo. A complex surface will be introduced to the Revit project, and we will use Dynamo to create a rationalized waffle grid from the shape. Bounding box operations and plane intersections will be dealt with on a more in-depth level. Part 3 of 3. In this lesson we will use the geometry created in the prior tutorial and export it to an external SAT file. We will also use a similar operation to import from Dynamo directly into the Revit environment, using the Instance By Geometry node. In this lesson we will show how to import SATs file directly into your Dynamo or Revit environment. Referencing these file types allows us to create a fluid workflow between Revit and other programs. Arguably the most important lesson about interoperability, this tutorial will show how to import Excel data into Dynamo to array adaptive components. Part 2 of 4. Arguably the most important lesson about interoperability, this tutorial will show how to import Excel data into Dynamo to array adaptive components. Part 3 of 4. Arguably the most important lesson about interoperability, this tutorial will show how to import Excel data into Dynamo to array adaptive components. Part 4 of 4. This lesson will introduce users to the image sampler, and use a sampled image’s brightness to set parameters and override colors in view. Part 1 of 2. This lesson will introduce users to the image sampler, and use a sampled image’s brightness to set parameters and override colors in view. Part 2 of 2. This lesson will expand on overridden colors in a Revit view and will look at analysis of panels on a doubly curved surface. The user will learn how to color code a panel based on area or plane deviation. This lesson will focus on writing Panel Deviation values to excel to complete the feedback loop. Geometry is generated from Excel data, analyzed in Dynamo, and then written back to Excel. This lesson will focus on preliminary analysis of panel orientation relative to the sun at a given point in time. This lesson will take the power of the code block a step further. A complicated Dynamo graph from earlier in this course will be reduced to a few code block nodes, using Design Script and functions. Part 1 of 2. This lesson will take the power of the code block a step further. A complicated Dynamo graph from earlier in this course will be reduced to a few code block nodes, using Design Script and functions. Part 2 of 2. The final lesson in this series will use Python to create basic conditional statement within a loop function. provided by the Dynamo community. Download the latest Autodesk University workshop materials and datasets.